In today’s blog post, we continue our story of the development of the theory of continental drift – an idea which just celebrated its 100th birthday. Before Alfred Wegener’s 1915 book on contintents in motion, a few others had the idea, yet no one had developed it as thoroughly. 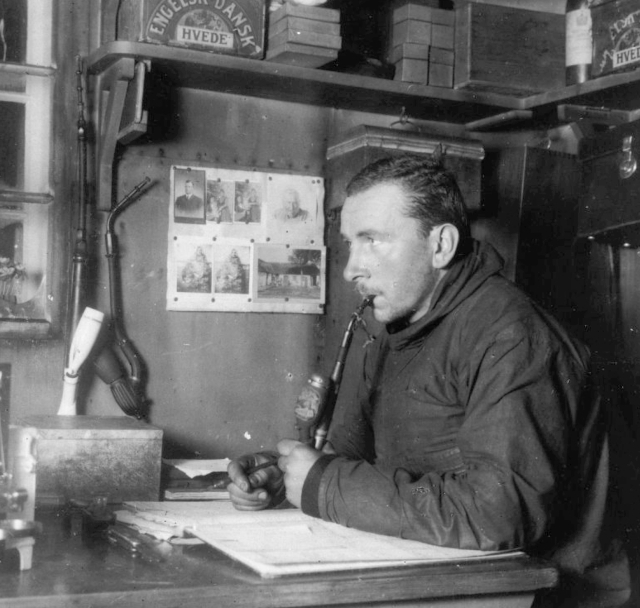 In Part 1 of this series, we covered a bit of Alfred Wegener’s early life and some of his initial work. Yesterday, we showed how fossils and palaeoclimate figured into his continental drift theory. Today, we continue with Wegener by looking at his idea in a little detail. 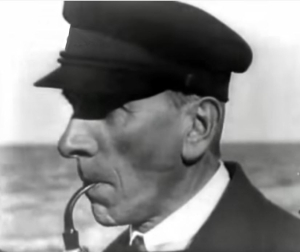 It’s been 100 years since Alfred Wegener proposed his idea of continental drift. Today’s blog continues the story we began yesterday – the tale of Wegener’s life and the development of his grand idea of mobile continents. This time, we’ll look at the significance of fossils and climate and how these contributed to the drift theory. By 1900, most geologists and biologists accepted Darwin’s description of species evolution. Darwin noted that the offspring of various creatures, isolated from each other and exposed to different environments, evolve into quite different beings with the passage of time. For example, bison arose on the American plains while the wildebeest fills a similar ecological niche in Africa. Both form huge herds, mostly survive by grazing (eating grass and seeds), but also by a little browsing (munching on the odd shrub). Both animals have manes, wild beards, and both look like trouble. Wegener is not the only scientist for whom meteorology has been the starting point on the path to other major discoveries. It influenced Dalton’s thinking in the development of atomic theory, while writing computer programs for meteorology was Paul Crutzen’s first step towards discovering how CFCs were destroying the ozone layer. Wegener himself gets a supporting role in the admirable Horrible Science book (reviewed here), Evolve or Die. Fifty years ago, we finally figured out why the Earth has mountains. But one hundred years ago, Alfred Wegener had already offered an explanation – it took those extra 50 years for his grand idea to catch on. The continents, Wegener said, wander about. They bump into each other. Accidents cause mountains. Yea, it’s been a hundred years since Wegener first wrote about continental displacement. A few other people had similar notions earlier. In the 1600s, Francis Bacon speculated that the southern hemisphere’s continents were arranged “like an opening blossom.” Some say Bacon was wondering if they had drifted from an original supercontinent, though Bacon never really said that. For some time I have been looking for a good way to immunise children (and others) against the absurdities of creationism, as the virus spreads across the Atlantic. I may have found what I’m looking for in the children’s section of my local public library. Horrible Science – Evolve or Die. Horrible Science is a sister series to Horrible Histories, popular on both sides of the Atlantic, but especially in the UK. This book promises, and delivers, “science with the squishy bits left in”. We learn, for example, what “coprophagous” means, and that rabbits are coprophagous, and why. And what coprolites are. And how this relates to the personal habits of leaf-eating dinosaurs and why we think they must have produced thunderous farts. All part of a calculated strategy of demystification, which is one of the most delightful things about this book. Scientists are shown disagreeing, admitting ignorance, being proven wrong, being mean to each other, and you could be a scientist too. Children (and adults) who read this book will end up less frightened of science, more impatient with the pomposity, complexity, and jargon that goes with bad science teaching, sceptical about authority, and aware that any scientific claim must be based on evidence and could be overturned by further evidence. The book does this by example, rather than by exhortation. 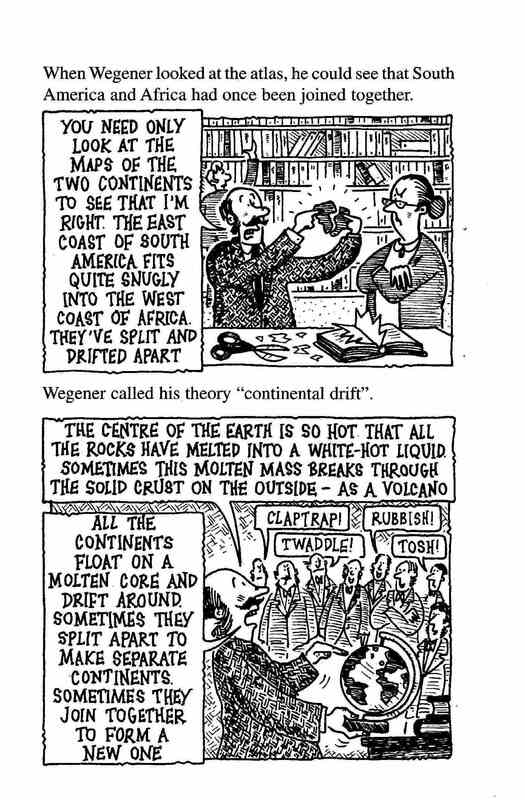 For example, we have Alfred Wegener being laughed at by his contemporaries, although we now know he was right about how continents drift and even about how molten rock beneath them makes this possible (I never knew he got that bit right too, although as I said in an earlier post it was Arthur Holmes who explained what drives the process). We are given four separate theories about what wiped out the dinosaurs, and when we are told which one is correct (or rather, as the book says, “the one most scientists favour”) we are given a quick rundown of the evidence; cratering on planets and asteroids, other collisions between Earth and smaller asteroids, the monster crater off the coast of Mexico, and the iridium-rich layer laid down some 65 million years ago all over the world. When we are told that the adder’s tongue fern has 630 pairs of chromosomes, we are also told that no one knows why. We hear about mosquitos, malaria, and mutations, and the evolution of drug resistance by malaria parasites. We are given numerous other examples of evolution, with discussion of how complex organs originated. The wings of pterosaurs could have started out as temperature control membranes, and the lungs of land animals are directly related to those of lungfish. The eye, of course, elaborated in stages from a simple pinhole like the one still found in snails. I would have liked a page or two here on dinosaur feathers, still a rare novelty when the book was first published (1999), but well established by the time of the current (2008) edition. We are also repeatedly reminded that science is a human activity, and that humans often make fools of themselves. So we have a Hall of Fame, with Lamarck, Darwin of course (not Wallace, though he does get a fair mention), Hippocrates who got inheritance wrong but at least had a go, Mendel, Wegener, Watson and Crick (I’d have liked to see Rosalind Franklin too, of course), and Louis and Walter Alvarez, each of them fleshed out with details of their times, accomplishments (more varied than I’d realized), and at times shortcomings and absurdities. You are invited to make your own observations; “Could you be a palaeontologist? 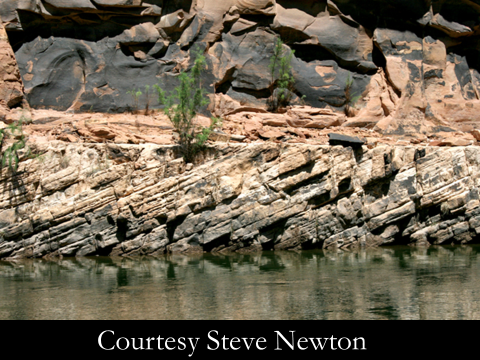 You need a hammer, goggles, tons of patience!” There follows a very clear explanation of the difference between igneous, sedimentary, and metamorphic rocks, and reasoned advice that sedimentary rocks are what you should be looking at when fossil hunting. The section on Mendel is followed by a suggested experiment on pollen transfer using nasturtiums and a paint brush, and there is a very squishy suggested experiment (see below) to illustrate the principle of continental drift. I particularly liked the way the book treats continental drift. You’re invited to test your teacher by asking for an explanation of the fact that identical mosasaur fossils are found in both South America and Africa (long distance swimming, or riding logs, or vanished land bridges – an explanation that was actually taken seriously for many decades – or identical evolution in both continents, or the two continents having once been joined together). This leads on to the idea of continental drift, and hence to what we grown-ups call biogeography; you find mosasaurs on both sides of the Atlantic, because they evolved before it opened, but the difference between Old World and New World monkeys is the result of evolution since that time. I do have some criticisms. Much too much is made of “living fossils”, ignoring how far they actually differ from their ancestors. For example, it was already known when the current version of this book appeared that coelacanths are a diverse clade. 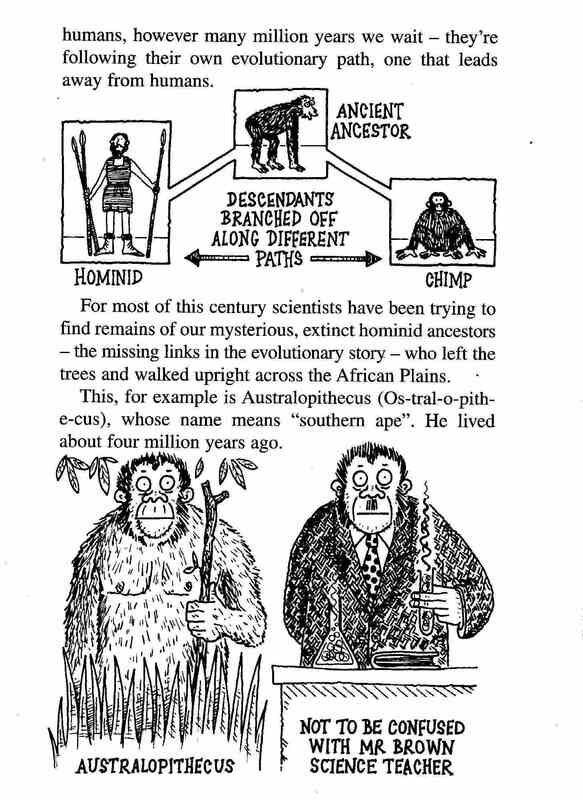 Of the dozen pages in the section on hominid evolution, one is wasted on Piltdown Man, a forgery exposed 60 years ago. And while it is inevitable that the human evolution section has a rather old-fashioned appearance about it (in 2008, Ardipithecus was only represented by fragments, it was not yet known that humans and neanderthals had interbred, and Australopithecus sediba was still undiscovered), it is nonetheless too apologetic about the deficiencies of the (then) fossil record. After all, The Last Human, which lists 22 separate species, had appeared in 2007. I have already mentioned dino feathers as another development that should have been included in the 2008 update. However, all of these criticisms are at a high level, and reflect my sensitivity towards what the creationists call “weaknesses” in the science of evolution. I particularly value this book because it builds on what every child knows; the poo-laden squishiness of reality, fascinating, beautiful, and cruel. 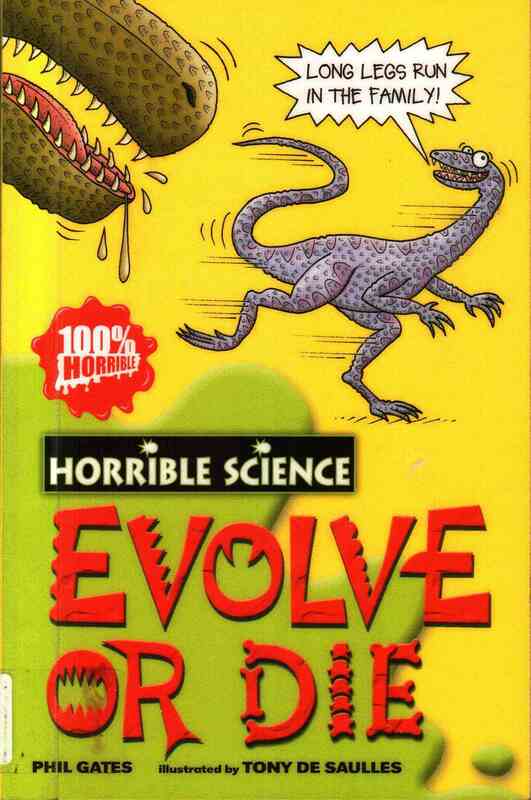 Children who have read this book will have no difficulty in recognising the creationists’ prelapsarian perfection, with its vegetarian velociraptors and lamb-cuddling lions, for what it is – so much dino dung. And they will know how best to respond – with a dino-size fart or if, like me, they are pretending to be grown-ups, with a philosophical and factual analysis, which will come to much the same thing. The central role of experimental crystallography in unravelling the structure of DNA was acknowledged by giving a share of the resulting Nobel Prize to Maurice Wilkins, Franklin’s nominal boss. Franklin herself was by then ineligible because she was dead. She is remarkable for having been involved with two separate Nobel prize winning enterprises, the other one being the structure of the tobacco mosaic virus.